REF. Reference Of Sweden Weightless Volume Shampoo (285ml) is a sulphate-free shampoo for use on fine, lifeless hair. Natural Quinoa Protein strengthens and protects the hair structure, sealing in hydration for increased volume. Blending Jojoba and Sunflower Seed Extracts, the formula boosts density and shine while organic Grapefruit Extract gives the hair a revitalising lift. Long-lasting colour depth and intensity is ensured by the REF Colour Preserve System. Cruelty-free and vegan-friendly. Apply to wet hair and massage into hair and scalp. Rinse and repeat. For optimum results, follow with REF Weightless Volume Conditioner. Shop online at Justmylook in complete confidence as all online payments are 100% secure. You can either pay using your card through our secure servers or alternatively checkout via Paypal for fast, convenient payment. Justmylook offers free delivery on all UK orders via Royal Mail 48 & Royal Mail 48 Tracked. Delivery should normally take 2-3 working days depending on the time you place your order. You will be given an estimated delivery date at the basket page. Royal Mail 48 Tracked: Orders are usually dispatched the same day when placed before 2:00pm Mon-Fri. It should normally take 2-3 working days for delivery. Royal Mail 24, Royal Mail Special Delivery & DPD: Orders placed before 3:00pm are usually dispatched the same day. Orders after this threshold will be dispatched the next working day. Express delivery is available from only £1.95. We dispatch our express orders via three different delivery options. The services available are Royal Mail 24 Tracked (not guaranteed), DPD (guaranteed) or Royal Mail Special Delivery before 1pm (guaranteed). Royal Mail Special Delivery is our only guaranteed Saturday service. DPD express delivery service includes door to door tracking, SMS alerts and a one-hour time slot for delivery so you know exactly when to expect your beauty goodies! We do not allow collections. If you would like to return your order, please contact us (via this form) prior to sending your parcel back. Justmylook.co.uk accepts returns on all orders, as long as you notify us within 14 days of receipt that you're wanting to return your order. You then have a further 14 days to physically return the products. You will be responsible for the cost of returning the goods unless we delivered an incorrect item or the item is faulty. Please ensure that you keep a copy of your proof of postage, as we can't be held responsible for goods that have either been damaged or lost in transit. Goods must be returned in their original, sealed packaging and re-saleable. (This does not affect your statutory rights) If items are received back damaged, or missing items we are entitled to make a charge to cover the cost of this, and thus this may affect the amount credited to you. We aim to process returns within 5 working days of receiving the item back. If we deliver an item in error or a damaged item, we will cover the cost of returning this to us if required. Please note that we will only cover the cost of standard shipping for this. If you do receive a damaged item, please do not dispose of this without prior written confirmation from us as we may require it returned (at our expense). In the interests of hygiene we are unable to exchange or refund any grooming, cosmetic or electrical products once the security or hygiene tag/seal has been removed, or if they show signs of use unless the items are faulty. 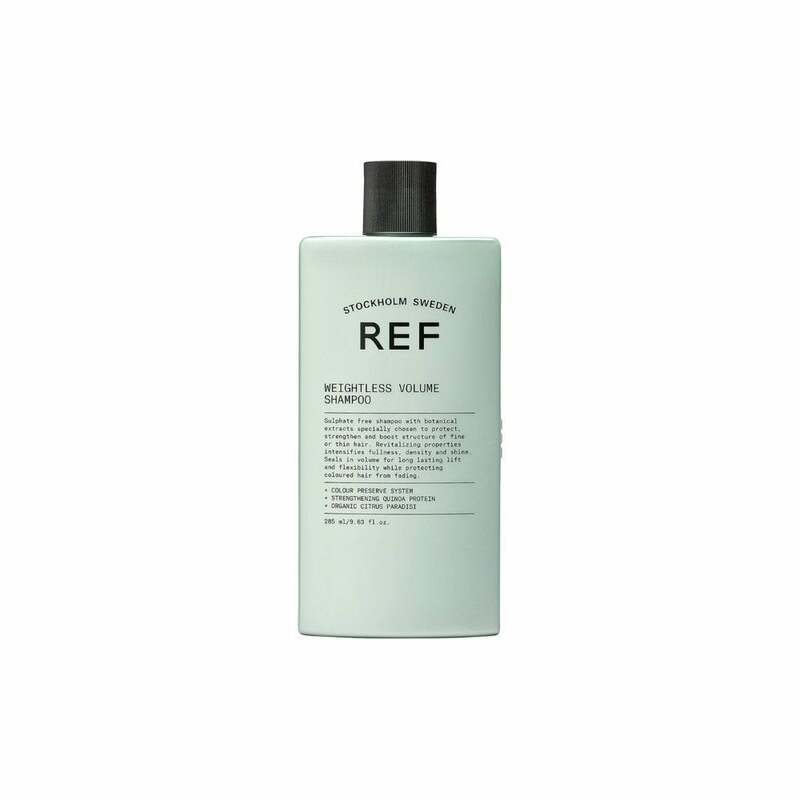 The REF Weightless Volume Shampoo leaves my hair feeling both revitalised and looking naturally shiny. Performs wonderfully in collaboration with the REF Weightless Volume Conditioner. Please take a chance, you will not be disappointed!